Okwhan Yoon is from South Korea. 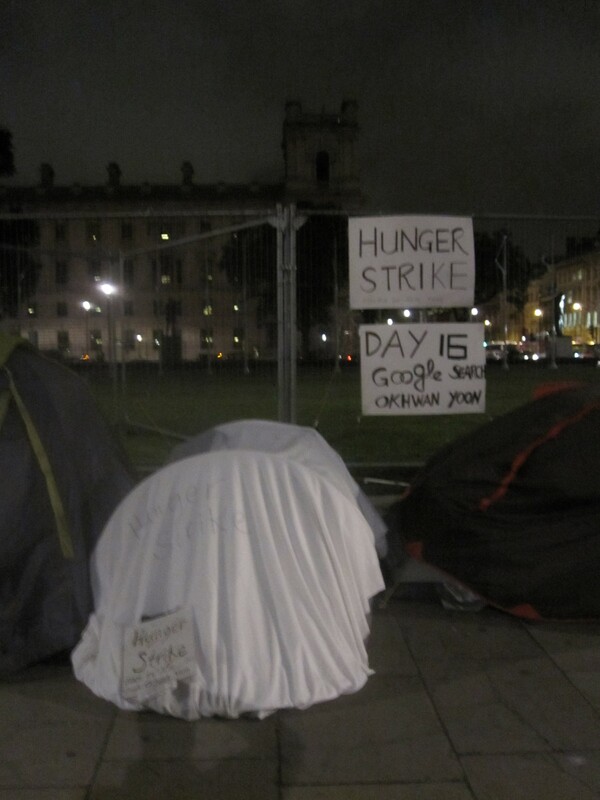 He recently arived at Parliament Square and started his hunger strike on 26th June 2011. He has been on a ten year, global cycling tour, in order to inspire and promote the message of peace. Okwhan is now on day16 of his strike, demanding freedom for North Korea and the opening of the border with South Korea bring with it democracy for the people! 60 years of isolation and oppression has now past and the time has come for the people to make a peaceful stand for change. As you will appreciate, being a cyclist, his body weight is minimal, and so the hunger strike will take its toll on him quciker than a person with greater body mass. He is a gentleman, quiet and thoughtful. He is also determined with a strong mental focus. A press release has been sent out. Also the All party group for both North and South Korea have been notified that he is at the square. We encourage people to support him in his great struggle. He is sincere in his effort. “I have a dream that one day there will be a united Korea and a united world. North and South Korea represent the last country that is divided by ideology. When Korea is finally reunited it will be a great step towards world peace. I’m convinced that the meaning of the world peace is to understand and respect each others: ideology, culture, religion, language, and identity. Understanding one another forms a deep connection from heart to heart, society to society, and boarder to boarder. AMMAN – Very few people would choose to become homeless and wander around the globe. But then again, very few people are like South Korean cyclist Okhwan Yoon. The 48-year-old told The Jordan Times that a passion for peace, patience, guts and discovery has taken him across six continents in a quest to spread his message in every country in the world on two wheels. “I suffered from chronic illnesses during my early life,” Yoon said noting that shortly after enrolling in the Chung-Ang University in Seoul, he reached the “peak” of his series of non-stop illnesses. Battling hepatitis B, asthma and allergies, he thought he was in “the final stage of life”. But his outlook on life was changed forever when as a university student he “was jailed and tortured for participating in protests against the military regime”. “After I graduated, I wanted to enlighten my- self by learning different cultures to understand why the world is full of wars, murders and suicides,” said the peace activist, who arrived earlier this month in Jordan, the 186th country on his worldwide tour. He decided the best way to learn about the world was to experience it himself, and chose to make the journey by bike as it is “the cheapest way of travelling and the most physically demanding”. He set off in 2001, riding to China on a bicycle. As his quest gained steam, he picked up sponsorship from friends, business owners and universities around the world in order to pay for his expenses. Yoon, who came to Amman from Syria, said he wants to open the world’s eyes to the importance of peace and tolerance by reminding each nation of the need to choose love and harmony over conflict, riots and war. Over the years of touring the US, Europe, Asia, Africa and the Middle East, it has not all been clear sailing for Yoon. He bears scars from attacks and kidnappings and has been struck by cars and involved in near-fatal accidents. The cyclist has also been robbed of his cameras and diaries several times. “I was kidnapped in South Sudan by rebel soldiers in 2004 and kidnapped four times in Africa,” Yoon highlighted. But the cyclist said he also has good memories from every nation he visited, adding that his length of stay in each country depends mostly on its size and variety. “Each country has its own flavourة for example I loved the exotic fruits and vegetables in Brazil, relished the cultural diversity in France and am enjoying the company of good people in Jordan,” Yoon indicated, adding that he will stay in the Kingdom until he receives a visa to visit Saudi Arabia. He said he will remain on the road until he reaches his goal of 192 nations, after which he plans to return to South Korea, write a book on his adventures and become a politician. Travelling with little more than his bike and a backpack, the 48-year-old said he sometimes feel nostalgic for his homeland and yearns for stability. “I sometimes cry alone, longing for my country and family… but I have sacrificed too much to end it now,” said Yoon, who confessed that he is still driven by the urge to travel. “I am addicted to travelling and meeting new people. This is bigger than a normal life,” he said. The final countries on his itinerary are Bhutan, Nepal, Saudi Arabia, the Maldives and several island nations, according to the peace activist. In January, the British traveler Mark Boyle set off from his home in England to embark upon a hike across two continents all the way to India. He got as far as France. Northern France. Okhwan Yoon, from Seoul, South Korea has made it a little further. Setting off in 2001, he has cycled thousands of miles across Asia, Africa, Europe and the Americas. A few days ago he entered his 169th country – the United States, crossing the border at Juarez into El Paso. I caught up with Yoon, 46, at the Bicycle Company on North Mesa this morning. A man of slender build, he speaks charmingly broken English and has been extended a warm greeting by the local Korean community in town. “I want to experience different cultures,” he tells me as he surveys the damage his exertions have wrought on his bike. But his interest in other cultures goes beyond casual interest. In May 2007, cycling through his 133rd country, he told Samoan reporters he travelled “to proclaim world peace.” Earlier this year he shared his slogan with TV crews in El Salvador: “one Korea, one World.” He elaborated this morning upon his hopes for world peace, his wish to work for an international organization and his plans to document his travels in an autobiography. But these ambitions have come at a price for the lonely cyclist. He has slept rough, been robbed and has labored through war zones (including Afghanistan). Saudi Arabia and Libya refused him visas. Most amazingly he was kidnapped in the Sudan only to escape several days later. But Yoon is philosophical about his experiences. “Whether good or bad, everyday [I] try to cultivate my soul,” he explains with an eerie simplicity. Such an attitude is obviously prerequisite to his perseverance. So far Yoon has been in six car accidents. The last of these left him in hospital for two weeks. His response has always been to dust himself off (and get his stitches removed) before cycling onward. Presently he plans to cycle to Los Angeles before flying to country number 170: the Bahamas. He intends (visas pending) to travel to a further 35 countries over the next three years before returning to Korea and settling down (and presumably investing in new legs). Before we finished I asked him about his hopes for the future. “No more car accidents please,” he replied with both a frown and a smile. As someone about to cycle across New Mexico, this seems rather idealistic. Grand Bahama Island – International cyclist, Okhwan Yoon of Seoul, South Korea visited The Bahamas via Grand Bahama Island as his 171st country on his world tour. Yoon set out in 2001 to find a place in the Guiness Book of World Records, but also more importantly, to make connections all around the world in an effort to encourage world peace. Upon arrival via a Discovery Cruise Line day trip, Yoon was presented with a welcome souvenir by the Ministry of Tourism & Aviation as a token of our appreciation for him having visited as well as our best wishes to him on his continued effort to make global connections.